Marvel Now is coming! 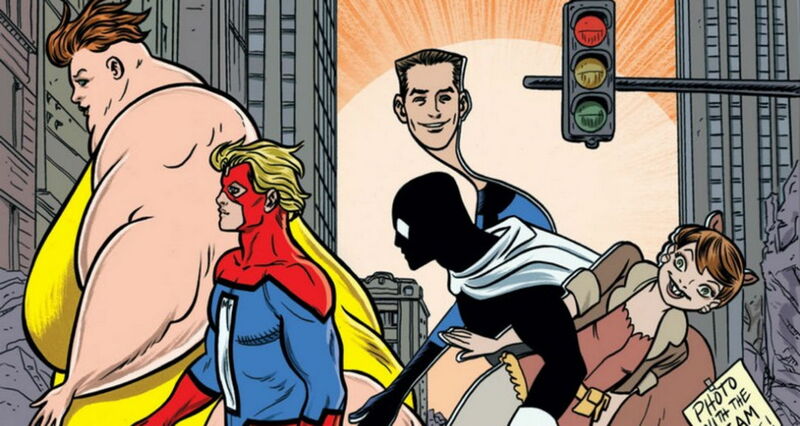 It seems there are just not enough superteams in the world, and Marvel is bringing back two with rather checkered pasts: The Champions, something of an also ran in Marvel history, and the Great Lakes Avengers, a team that never even got into the race. But perhaps the time is ready for these offbeat squads. The Champions return from Mark Waid and Humberto Ramos and are reveled as the subject of the “I Quit” teasers Marvel has been running. It seems that a bunch of teen Avengers are forming their own funky bunch, as revealed at EW. Nova, Ms. Marvel, Mile Morales Spider-Man, Amadeus Cho Hulk, Viv daughter of the Vision and a teen version of Cyclops will unite to squabble and fight others. Marvel Comics and Heroic Publishing have entered into a joint agreement that will allow for the publication of a Marvel’s CHAMPIONS comic book, while at the same time allowing Heroic to continue publishing its own line of separate CHAMPIONS and CHAMPIONS-related titles. We’re pleased to have reached an agreement and wish Heroic Publishing the best in their future endeavors. MARK WAID: You’ll know we’ve failed if by issue 5 the Masters of Evil show up and there’s a fight with the Absorbing Man. Clearly at that point we will have been a victim of mission creep. Tom and I talked about how there’s been a very interesting generational shift in the last 15 years. When we were growing up, the general perception was it takes adults to fix the world. Kids can do little things, but basically you have to wait till you grow up to make the big choices and the big decisions. Well, Mark Zuckerberg would disagree with you. Some of the other young trend-breaking scientists that are coming to light, online especially, would beg to differ with you. Those are the inspirations, as much as anybody else, for the idea that we don’t have to wait until we grow up to be Tony Stark or Captain America to make a difference in this world. We’ll find our way, and we’ll find our own way. This book hits in October with covers by Ramos and Alex Ross. People like to laugh and smile, even when they read comic books, it seems. PS: At first I thought The Badger, the 80s multiple personality crazed superhero created by Mike Baron and Steve Butler, was part of the GLA, but it seems the John Byrne-created Mr. Immortal is the separated at birth component. Byrne created the GLA in 1989 as part of the West Coast Avengers so domino masks and unruly blond locks were all the rage. with a USAvengers team book also coming out with more of a youth/different type characters vibe, does this mean we’ll be seeing more classic line-ups in the main stream avengers books, ’cause it seems that most of the characters that marvel was moving heaven and earth to get into the main avengers books seem to be moving on into books of their own. With Ms. Marvel (who can stretch), Spider-Man (who can become invisible) and Nova (who can fly and fire blasts from his hands) and the new Hulk (strong guy) it’s not The Champions, it’s the new Fantastic Four. If Viv is there um… maybe she’s the H.E.R.B.I.E?